Sunday was a very productive day for me. I wanted to workout, but instead I cleaned the house from top to bottom. With the way I've been running around lately, a good house cleaner I have definitely not been. So, the house is clean for now and the laundry is done...unfortunately only for now. We also enjoyed an incredible linner with friends. Definitely a great day! Monday, I was pretty much flying high after my workout in the morning. I got up at 5:50am with two workout buddies. People, I think my "me" time has become "we" time. Jay (13 1/2) is serious about running - this is a new thing. Max (11 this week) is serious about muscle toning - this is a new thing. I offered to workout with them after school yesterday, but they wanted to get up with me and workout in the morning. Since it's too dark to workout outside at 6am, I took them to the gym so Jay could run on the treadmill. I should make it clear to all those that don't like kids at the gym, I work at a small gym that is actually a good place for families to go. My kids are respectful of others at the gym and they clean the equipment better than most of the adults that go there. There were only 4 people at the gym when we got there so it worked out pretty well. Anyway, Jay needed a treadmill and since there were only 2 left, Max and I did two rounds of HIIT cardio and then I ran a mile with Jay when the treadmills cleared out. People, I did not HATE it. I pulled out my New Balance 760 and they felt a lot easier on the run. I also took my friend Heather's advice and went with a smaller stride and I felt a lot better about how I was running. I'm going to read up on it a little more too. I think Jay would benefit from some information too. He's talking about being interested in track next year when he gets into high school (where has the time gone?). Here's the thing. I don't ever think I will be a runner, but it always feels better working out with someone, especially in the beginning. Jay loves it and I want to be there for him as a partner so he's not at it alone. The workout was incredible and left me feeling really great yesterday. The kids were on the ball and things ran smoothly in the morning. You can't beat that! Not only that, they want more! I'm totally loving this! Tony slept...not acceptable! fluffy gluten free peanut butter and grape chia jam pancakes! Making jams with chia seeds has become an addiction for me. No fruit is safe! 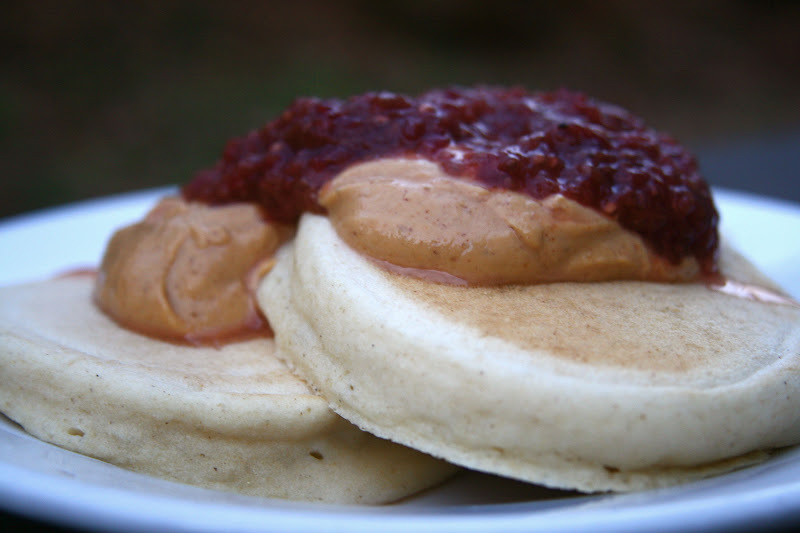 This one turned out more like a sauce since I didn't cook it, but it was such a perfect sauce for these pancakes! The pancakes were not only fluffy when made, but they actually remained fluffy for three days afterwards when Max ate the last two for breakfast reheated. We all loved this recipe! I took my nutmeg muffins, took out the sugar and played with a few things and they turned out exactly how I wanted them to be! Light, fluffy and a little doughy! Combine the apple cider vinegar and almond milk; set aside. In a separate bowl, combine the flours through the xanthan gum. Next add the milk mixture, egg whites and stevia to the flour mixture. Mix just until combined. Cook 1/4 cup at a time on a nonstick skillet until cooked on both sides. Process in a food processor until completely mixed well. Allow to sit in the fridge overnight. I'm sharing these on Simply Sugar and Gluten Free's Slightly Indulgent Tuesday. Wow those pancakes look so fluffy! And, I just love that you worked out with the boys. So cool. Glad the suggestion helped with the running and that it felt better. Definitely look into some running books. I think that's really smart. Oh Sarena! I can feel the excitement and energy in your words! How awesome is it in this day and age to bond with your children over exercise?! When I was younger, you had to trick me into exercising. BB and I were just talking about this on our run together on Sunday. I was diagnosed with exercise-induced asthma when I was a kid...and I used it to get out of anything and everything! Kinda funny to think about since I enjoy working out now! Haha! I swear those have got to be THE fluffiest gluten-free pancakes I've ever seen! I'm definitely trying your recipe as soon as possible. 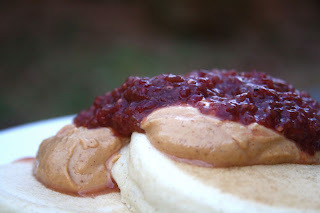 And you have got me so curious on these chia fruit jams/sauces...I need to get some berries pronto! I'm glad you're enjoying your runs! I don't think I wanted to go anywhere near a gym at that age. Your boys are lucky to have such a good role model. And wow, those pancakes are amazingly fluffy. I haven't used Bob's All Purpose Flour in a long time. I feel like I had a bad experience right when we first stated gluten-free. Maybe I need to give it another shot. I like to hope that more kids will eventually be like yours in how excited they are to be active. And to get up early... woah! It sounds so great to have your boys want to work out all together in the morning. I love that they have their own interests in the gym too. What lucky boys they are to have you! Love that your boys wanted to get up and workout with you. Makes me happy, and I hope our kids will enjoy being active as a family someday. So, I'd probably skipped the Tabatas these days, but I'd be all over that breakfast!!! What a wonderful way to start your days, for you and your boys! I'm glad you had a *little* bit of time to catch up on sleep and house work over the weekend, and I hope this week is more energizing than exhausting! you know how i said i want to come have coffee with you? well now i want to come workout/run with you TWO, then eat pancakes, and drink coffee. K? no fruit is safe - hee! I will be making them though! Hopefully your week slows down, Sarena! Those pancakes are the fluffiest! I've never tried adding ACV. oh fun that your boys get up with you and workout!!! i sure hope when i have kids they want to be active like that. 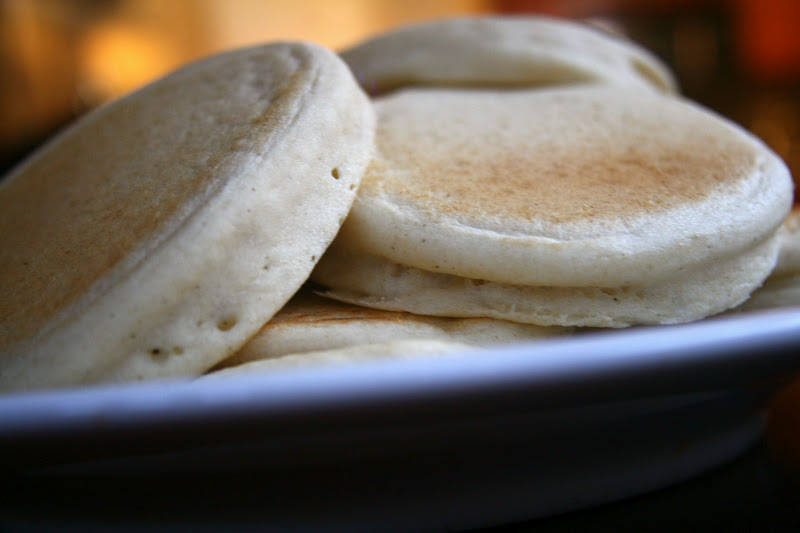 and those pancakes...they look perfect! seriously the best looking pancakes. and love the chia jam! Oh Sarena- I am with you on being worn out (as you know). How fun that you got to workout with your boys at the gym. I can't wait for those days. Glad the smaller strides helped too. :) And um, those pancakes look absolutely amazing. Chia jam- I'm addicted as well. No fruit is safe here either. I haven't tried grape though. Thanks for the idea! :) Hugs friend! Here's hoping in a few years we'll be relaxing on our farms with our coffee talking blogs and training clients. Hugs! Kristina - I definitely think it would work without eggs! I put them in there for protein. Since I can't have soy, I have to make sure I sneak it in other ways. I would add water or more almond milk for the eggs...oh or chia gel or flax gel! Let me know when you make them and I'll be over for breakfast! Every now and then the hubby and I go to bed at the same time as the kids (around 8:30 or so) and man do I feel amazing the next day. Makes me wonder why I do not do it more often. LOL Sounds like you definitely needed that reset! These pancakes sound amazing. I am going to make them this weekend. Fluffy pancakes are my favorite breakfast! !